Oregon grape (Mahonia aquifolium) flowers; photo by Todd Petit on Flickr (use permitted with attribution). 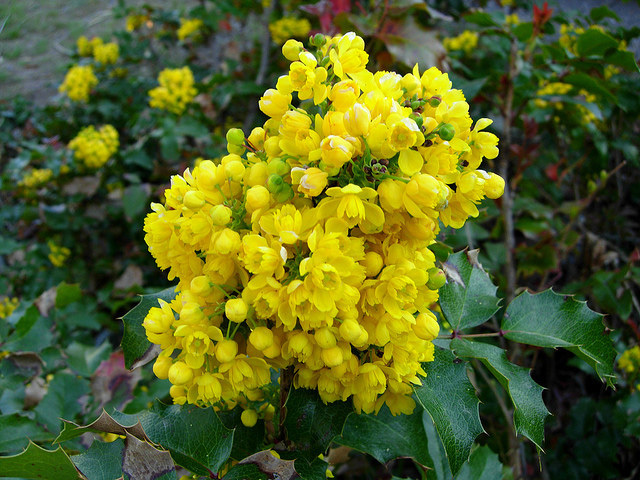 Also called holly-leaved barberry, the Oregon grape (Mahonia aquifolium) is a shrub native to much of the Pacific coast and and is also found sparsely east of the Cascades. Its year-round foliage of pinnated, waxy green leaves resembles holly.and resists wilting (the foliage is sometimes used by florists for greenery). 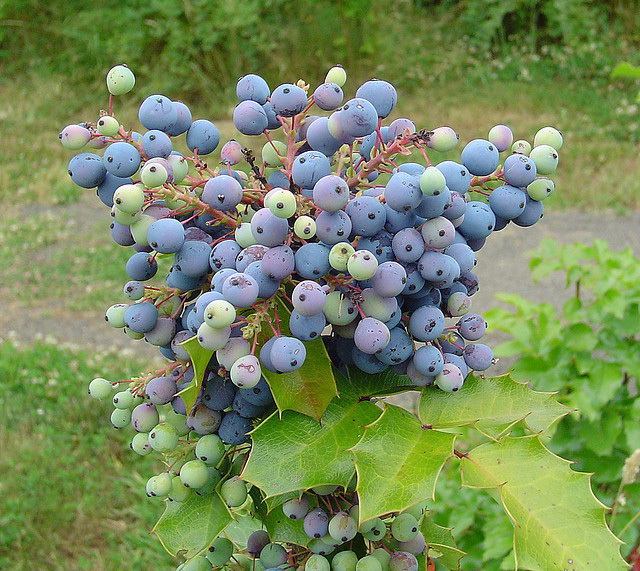 The Oregon grape plant bears dainty yellow flowers in early summer and a dark blue berry that ripens late in the fall. The fruit is tart and bitter, containing large seeds, but can be used in cooking (it's used to make jelly locally). The inner bark of the larger stems and roots of Oregon grape can be used to make a yellow dye. Oregon grape root is also used medicinally. Ripening Oregon grape berries; photo by Tom Brandt on Flickr (use permitted with attribution).